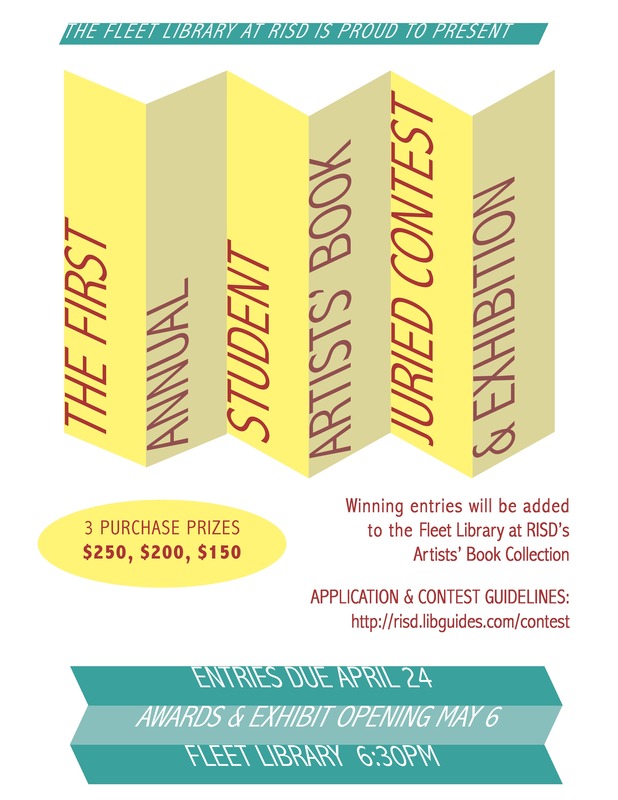 The Fleet Library at RISD is proud to present the 1st Annual Student Artists’ Book Juried Contest and Exhibition. Undergraduate and Graduate Students are invited to enter an Artists’ Book they have created in the past year. Deadline for entries is April 24, 2015, at 4pm. All entries will be exhibited on the 2nd floor of the Library from May 6 to July 6. Opening reception and cash prizes announcement, May 6 at 6:30pm, 2nd floor of the Library. Students awarded the cash prizes will have their work included in the Library’s Artists’ Book Collection. See the website for entry form and more information.